I die-cut three small poinsettias, sponged red around the petals to give definition, and then shaped them with my stylus and mat. I glued the layers together and added some gold liquid pearls for the center (exact match to the gold background!). I glued the poinsettia to the panel using a good dollop of Crystal Effects and also added drops under some of the petals so when it dried, it would hold the flower up to keep it's shape. The sentiment is stamped in red and then clear embossed to keep with the shine on the rest of the card. I'm entering this into the latest challenge at ATS&M #93 - Holiday, Sparkle Christmas #22 - Anything Goes, and it will be my second entry into Simon Says Anything Goes. Since I was posting my Christmas card above, I thought I'd share two more Christmas cards I made for the Dirty Dozen Design Team last October, theme "It's about Time". The first card is for the sketch challenge that was associated with the Fan Club Challenges. The second is my favorite card I made for the DD for October. Each month the Dirty Dozen post their cards and marks one of them as their favorite for the month. This is for "Winter Time". 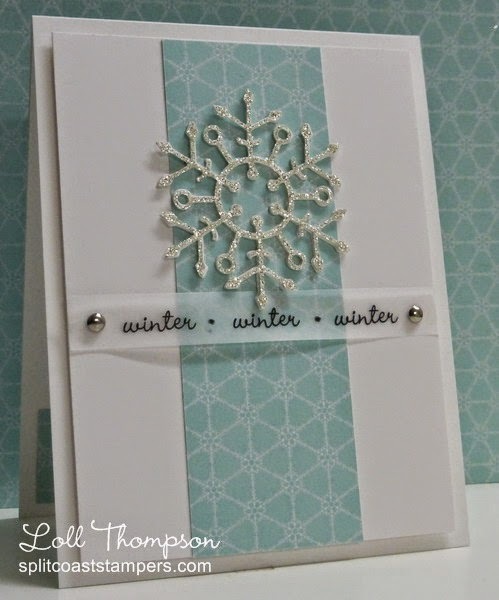 I used a strip of DSP and placed a silver glimmer snowflake on top. The sentiment is computer generated and I printed it onto vellum. This is my favorite card I made for the October Fan Club. This is "Christmas Time". I sponged two shades of blue ink for the background and then layered several white pine branches which I had die-cut and painted with some silver glitter to add sparkle. I framed the tree with a circle die-cut and added a silver glimmer star to the top of the tree and simple sentiment. Love that silky gold embossing! So rich and stunning! The poinsettia looks so pretty on it! And both of these are among my favorites of your Christmas cards! 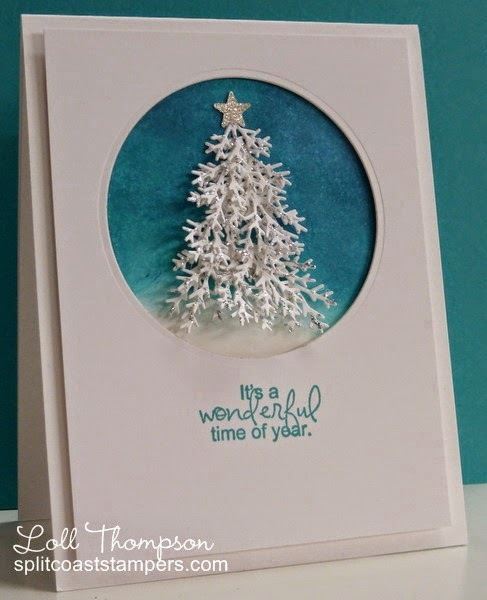 Love that sweet snowflake and the white tree is gorgeous against the sponged background! 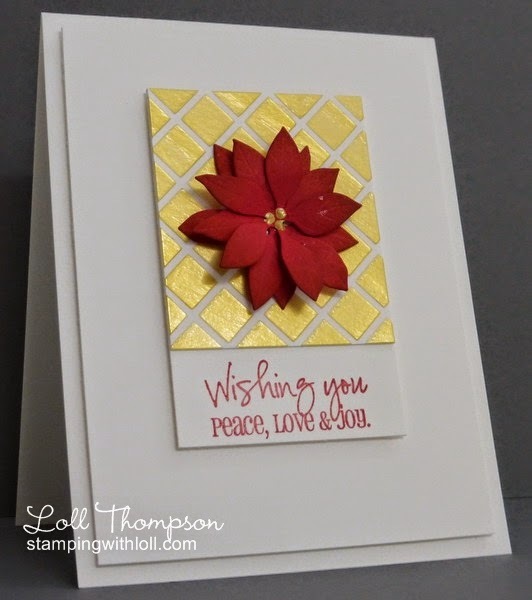 The Poinsettia card is beautiful, I gel gloss really sets off the red ..
OMG Loll...I Love your gold metallic stenciled BG :-) TFS this beauty and again your DD Girls Christmas Cards mf. I'm sitting here in awe of 3 such gorgeous cards! I love all of them! That gold paint and gel medium is fabulous! Wow Loll, that gold background is absolutely luscious.......but my favourite (and also your) is the third card - it's stunning. Fabulous Christmas cards, Loll. I love the depth of colour on the third one! I think all these cards are absolutely super. So clean and simple, so elegant. Thanks so much for playing along with ASM this week!